Srinagar: The Army and BSF have been put on the highest degree of alertness along the border here after air space violations by the neighbouring country and the night-long heavy firing and shelling by Pakistani troops on forward and civilians areas across the LoC which stopped on Wednesday. Authorities have ordered temporary closure of educational institutions in a 5-km radius along the Line of Control (LoC) in Rajouri and Poonch districts on Wednesday amid mounting tensions between the two countries, following the Pulwama attack on February 14 and an Indian air strike inside Pakistan. All residents of the border areas have been asked to remain inside their homes and not venture outside. “There was night long-heavy firing and mortar shelling along the LoC in most of areas in Jammu, Rajouri and Poonch districts. However there was no firing and shelling from across the border on Wednesday,” officials said. 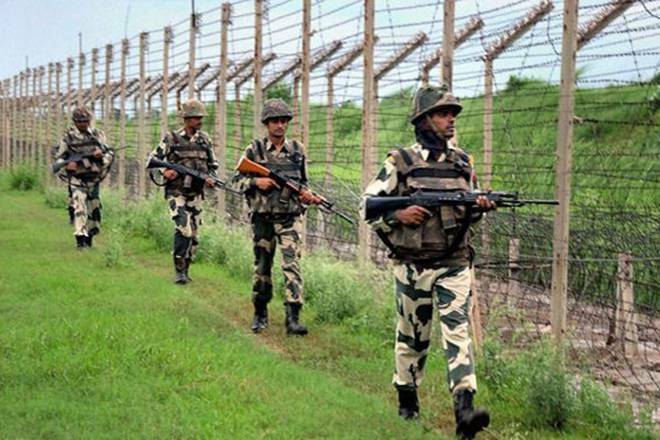 “Army and BSF troops have been put on highest alert along the LoC and International Border (IB) in view of the high degree of tension in wake of air space violations,” they said. According to some reports, panic gripped the residents of border areas and some locals have left their homes and moved to safer areas. Pakistan on Wednesday said that its jets crossed the Line of Control to undertake strikes in India for “self defence”. Indian officials said Pakistani fighter jets on Wednesday violated Indian air space in Jammu and Kashmir’s Poonch and Nowshera sectors but were pushed back by Indian aircraft. From 6:30 pm Tuesday, the Pakistani Army initiated unprovoked ceasefire violation by shelling with heavy calibre weaponry along the LoC. In exchange of fire, five soldiers of the Indian Army suffered minor injuries, out of which two of them were shifted to a military hospital for medical treatment. They are stable.